This project is currently in abeyance. Bookmark this page for further updates. 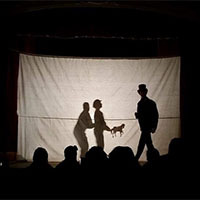 The unique project partnered students with professional applied theatre artists. It took them into the real life behind the scenes of Victoria's prize winning tourism site, and enabled valuable industry experience for our students at a critical point in their professional development. Led by Associate Professor Kim Durban, the project was part of the third-year professional practice course within the Bachelor of Acting for Stage and Screen and the Bachelor of Music Theatre programs. In an invitation to ‘shake up theatre at Sovereign Hill Museum’, actors and music theatre performers were offered a theme by Sovereign Hill. They collaborated across disciplines to work in a small company structure, and to imagine new theatre works for the museum environment. They then pitched their proposals to an industry panel with representatives from both organisations. Each organisation contributed $2,500 to the winning proposal so that it could be created and performed as a try-out at Sovereign Hill. Some of the winners went on to create companies with great success, including graduates who formed a professional museum theatre company in Melbourne, Two Friends Productions. This company now receives commissions for museum works across Australia. Read about our performing arts programs. Winners were Liliana Dalton (Acting), Leah Delaland (MT), Morgan Dooley-Axup (MT), Carly Jenkins (Acting), Madeline McKibben (MT), Jonathan Reeves (MT), Kate Tomkins (Acting), Jackson Webb (Acting) and Zara Wilson-Boyle (Acting). Happy Darwin Day (2009), Deep Water (2010), Raspberry Drops (2010), Cockatoo Stew (2011), A Dickens Christmas (2012), Miner Chef (2013), Spring Into Sovereign Hill (2014), The Enlightened Child (2015) and Horses (2016). One of the 2014 winners, Rebellion Theatre Company, penned these words in response to the Sovereign Hill Project. On behalf of 'Rebellion Theatre Company' I would like to thank you all for giving us the opportunity to perform during this September holiday break. As artists, we are all so thankful and appreciative that you chose our project. This meant we got to experiment a really exciting, interactive show in a one-of-kind museum. 'Spring into Sovereign Hill' really took flight during yesterday's two shows. We felt really settled in the space and began to understand how to work the crowd. The final show was a magical experience indeed. We found ways to warmly invite audience members to dance with us in the main street. This moment truly encapsulated the joyful/festive feel of the show, which was first mentioned in our pitch some months ago. With each performance, the show became more refined and interactive. At any opportune moment we invited the audience to clap with us, and we also ended-up extending the time spent asking the audience if they liked the colour of our material. I believe that this allowed them to feel very much included in the dance and creation of the flag. We trust that your vision for the show was fulfilled, and that we helped to contribute to the magic of Sovereign Hill. Thank you for providing us with such a wonderful experience. We all learnt so much about what it is to be a performer by learning from your knowledgeable staff - what an invaluable experience it has been! Thank you for being so open to putting on such an experimental show, and for being so accommodating to us as newcomer-artists to the industry. From Michaela Gauci & the Rebellion Theatre Co, 2014.